We're back from Lake Tahoe! 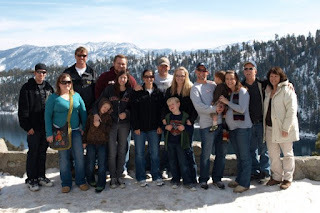 This weekend (almost) all my brothers, sisters, parents, and nephews went on a family vacation to Lake Tahoe, CA/NV. The weather was great, perfect in fact, and there was a bunch of snow. It's always so fun and good for the soul to spend time with your family and to simply share each others company. It was therapeutic, especially the time I was able to spend with my three nephews! We had a blast and God was truly with us, as attested by our mutual feeling or refreshment and plain-old-warm-feelings. Unfortunately, we didn't have internet at the cabin in which we stayed. So that's why I wasn't able to update the blog or write anything new. New I'm back and I'm looking forward to writing a bit more regularly.